I came across an art installation by Robert Bengston, et al, while researching photos for a recent post on intention. The installation was a part of Burning Man in 2008, and the more I learned about it, the more I knew I needed to engage my community about it. To re-contextualize and re-present democracy as an evolving means of social transformation. To integrate the wisdom of the Indigenous and the Feminine into our democracy. To inspire the visitor to answer the question: To What Do You Pledge Your Allegiance? as a means of seeing with new eyes and acting with new vision as a fundamental participant in the web of life. I’m enraptured by the concept of making a conscious choice to pledge my allegiance to each and every one of the twelve concepts addressed in the installation (see below). Kind of. Actually, what I’m even more excited about is engaging myself and you, my community, in what each of these concepts means to you and Your Authentic You. I’m engaging my community (that’s you!) because these thirteen topics can change the world. They can change the world, but not just if I write about them; only if we write about them. I know some amazing bloggers who drop by, read a bit, comment, and share every now and then. And I know those bloggers have minds, thoughts, brilliance that gets people to shift and think in different ways. To you, my reader, my blogger, my photographer, my tweeter, my friend: I’m asking you to engage with me and with your world at large. I’m asking you to share your thoughts, images, creative juices around one or all of the thirteen topics above. I’m asking you to make a difference. What would your life (or the next year or month or week or day or hour or minute) look like if you pledged yourself to one (or all) of the topics on that list? Maybe a look forward on your life and where you want it to be. Maybe how your life’s been affected by one or all. Challenge yourself to share a piece of you with all of us—and maybe even encourage others to do the same. Write on one or all thirteen of the topics in the month of June, in any order you choose. A post can be a sentence, photo or an essay—whatever you feel inspired to share. 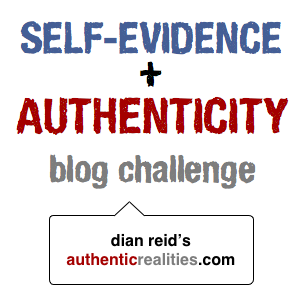 Share whatever you have to say/create around the Self-Evidence topics over the course of June. Don’t get hung up on details or length—you have my permission to shift it up to be as short, long, quirky, different, authentic as you like it to be—there is no wrong post/tweet/photo! A chance to express yourself. A chance to change yourself. Maybe even change someone else’s life by sharing. Maybe even change the world.